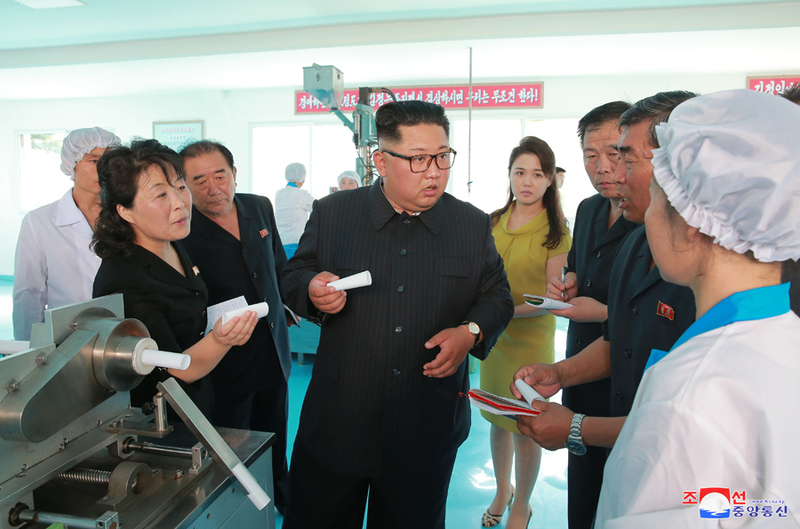 Kim Jong Un and Ri Sol Ju inspect toiletries produced by the Sinu’iju Cosmetics Factory (Photo: KCNA). 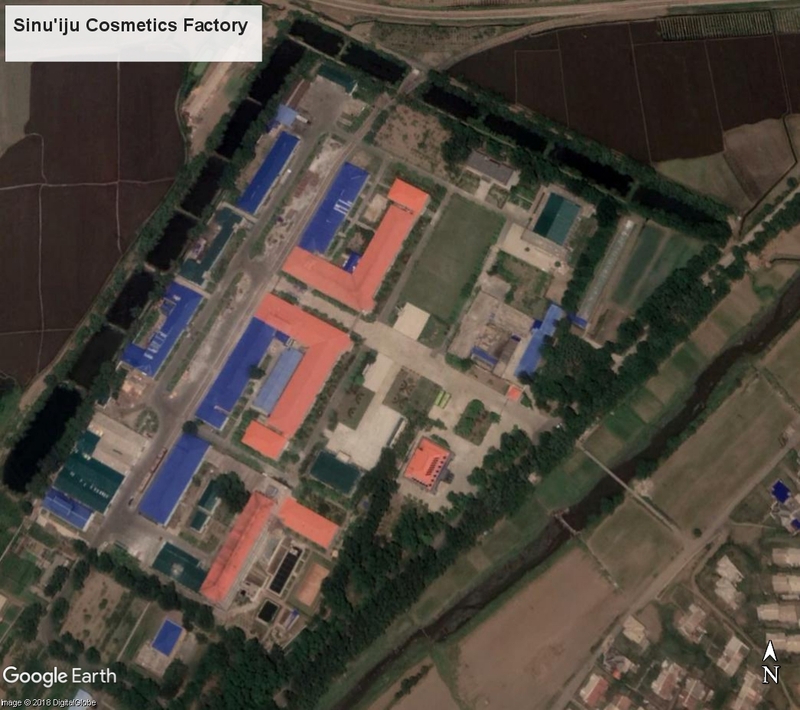 Kim Jong Un (Kim Cho’ng-u’n) and his wife Ri Sol Ju (Ri So’l-chu) visited Sinu’iju Cosmetics Factory during the afternoon of June 29 (Friday). Also in attendance was Kim Chang Son (Kim Ch’ang-son), the head of the Personal Secretariat along with senior Workers’ Party of Korea (WPK) Department Directors and Deputy Department Directors An Jong Su (An Cho’ng-su), Hwang Pyong So (Hwang Pyo’ng-so’), Han Kwang Sang (Han Kwang-sang), Kim Song Nam (Kim So’ng-nam), O Il Jong (O Il-cho’ng), Hwang Yong Chol (Hwang Yo’ng-ch’o’l) and deputy chief of the Personal Secretariat Jo Yong Won (Cho Yo’ng-wo’n). 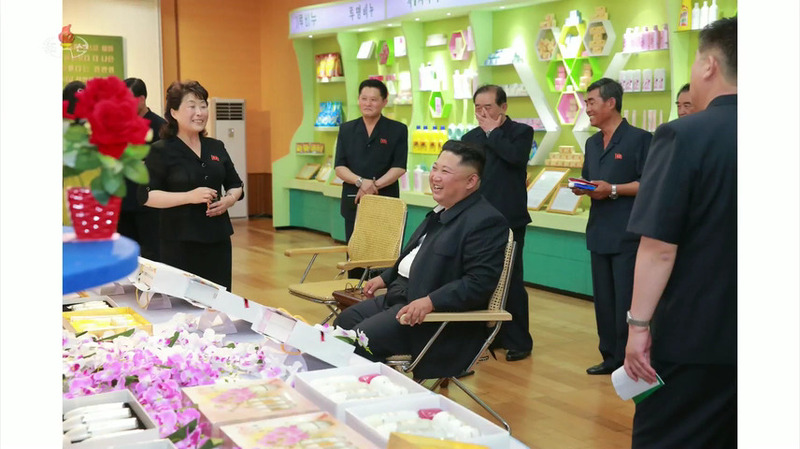 WPK Vice Chairman and WPK Light Industry Department Director An Jong Su introduces Kim Jong Un to the factory manager and party secretary upon arriving at Sinu’iju Cosmetics Factory (Photo: KCTV). 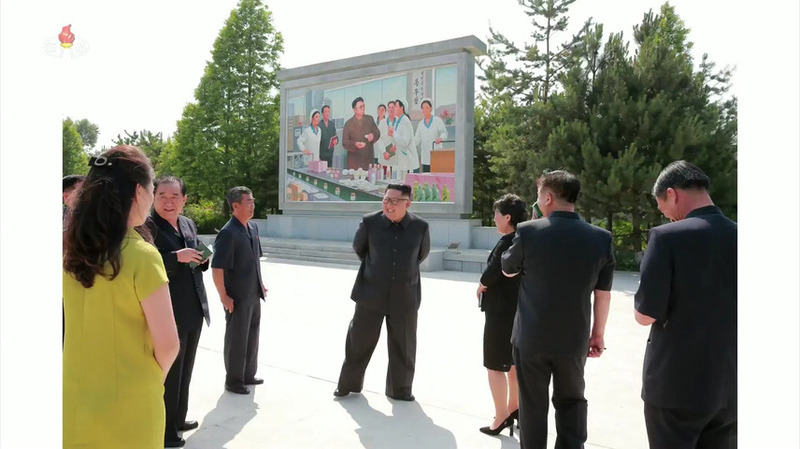 Kim Jong Un talks with senior WPK officials and Sinu’iju Cosmetics Factory managers in front of an icon monument of his father, late DPRK leader Kim Jong Il (Photo: KCTV). 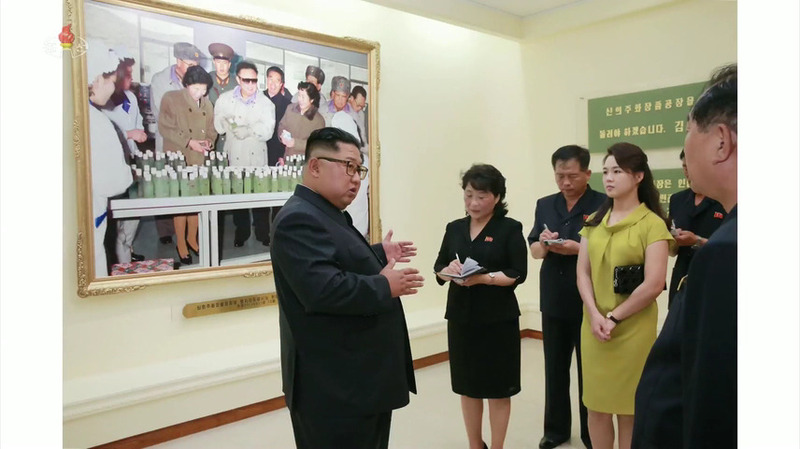 Kim Jong Un visits the revolutionary history room documenting previous #1 event at Sinu’iju Cosmetics Factory on June 29, 2018 (Photo: KCTV). 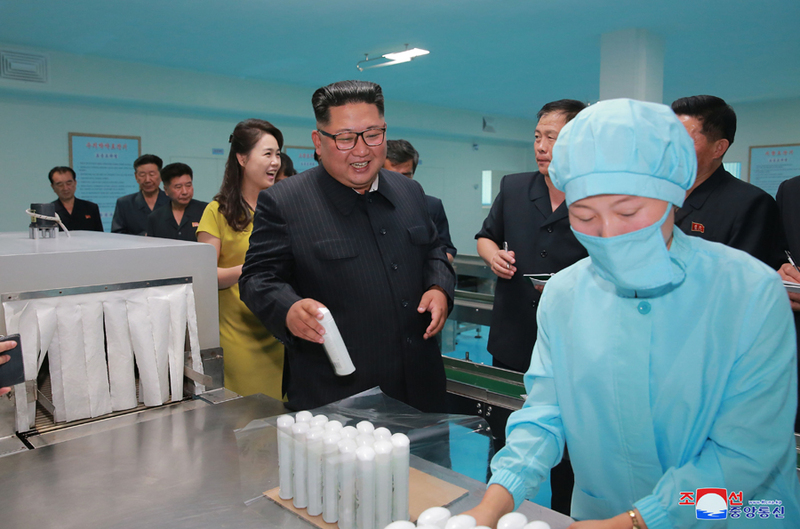 Kim Jong Un is briefed about the production of toiletries at Sinu’iju Cosmetics Factory in Sinu’iju, North P’yo’ngan Province on June 29, 2018 (Photo: KCNA). 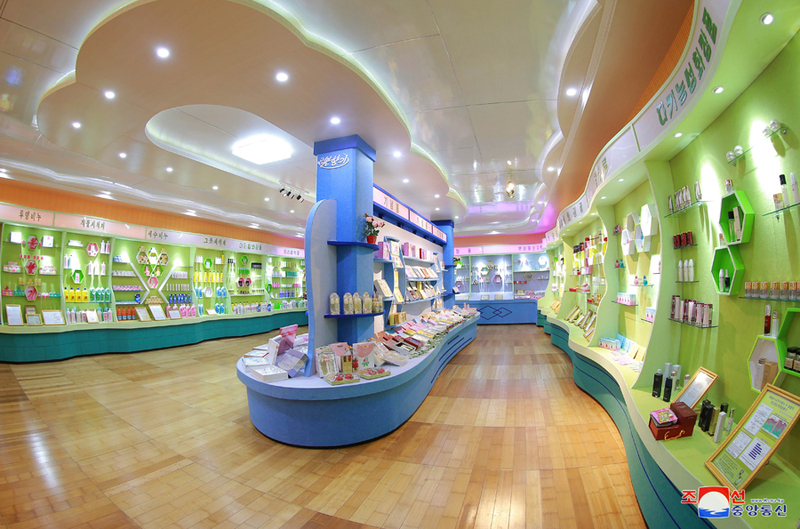 Products of the Sinu’iju Cosmetics Factory (Photo: KCNA). 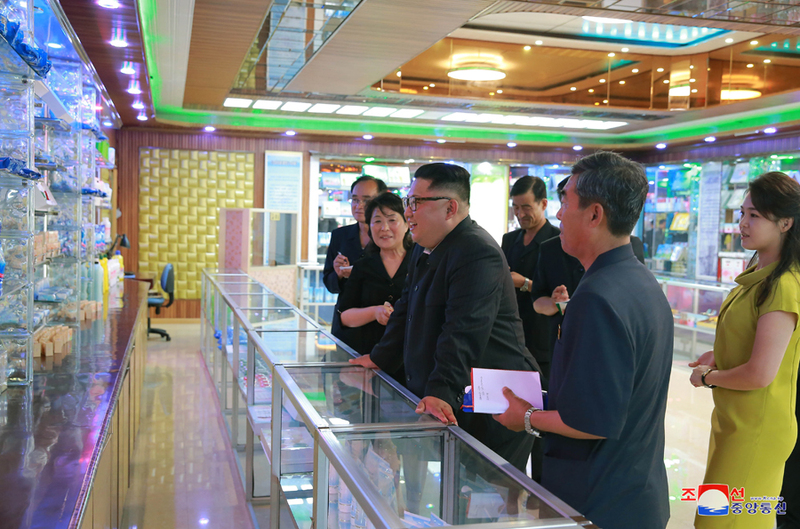 Kim Jong Un talks with WPK and local officials during his June 29, 2018 visit to Sinu’iju Cosmetics Factory (Photo: KCTV). 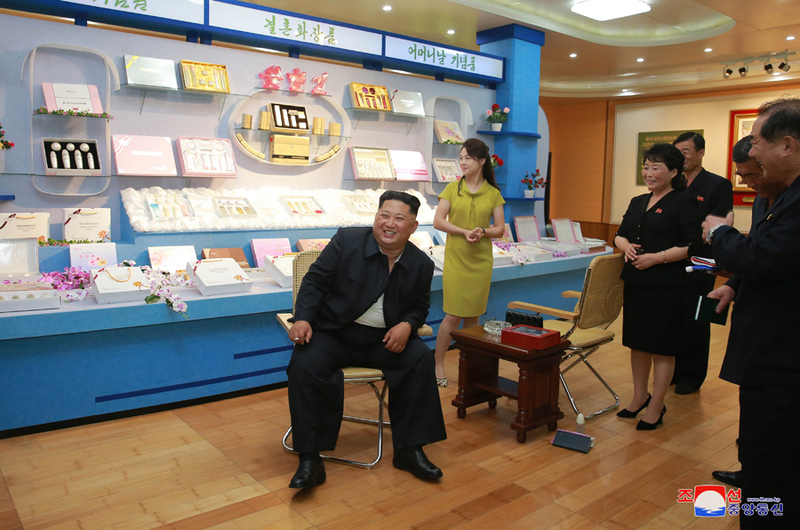 Kim Jong Un smiles while sitting in a product showroom at Sinu’iju Cosmetics Factory (Photo: KCNA). 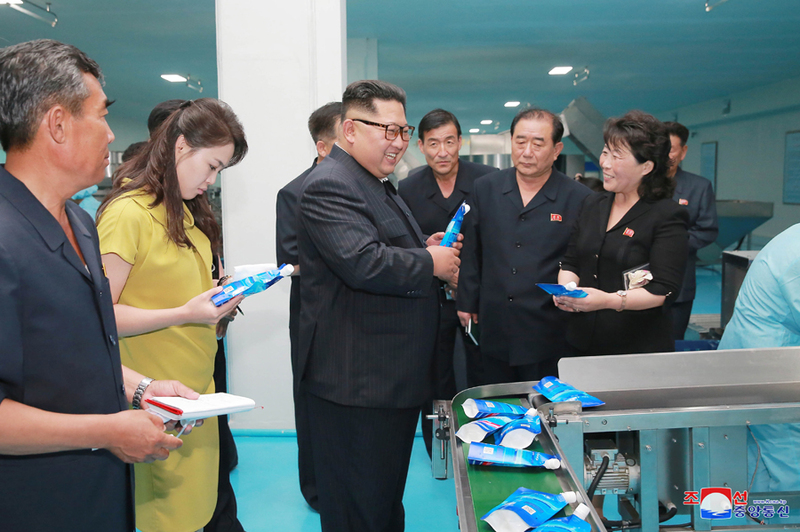 Kim Jong Un is briefed about different name brand toiletries and cosmetics in an exhibition at Sinu’iju Cosmetics Factory (Photo: KCNA). 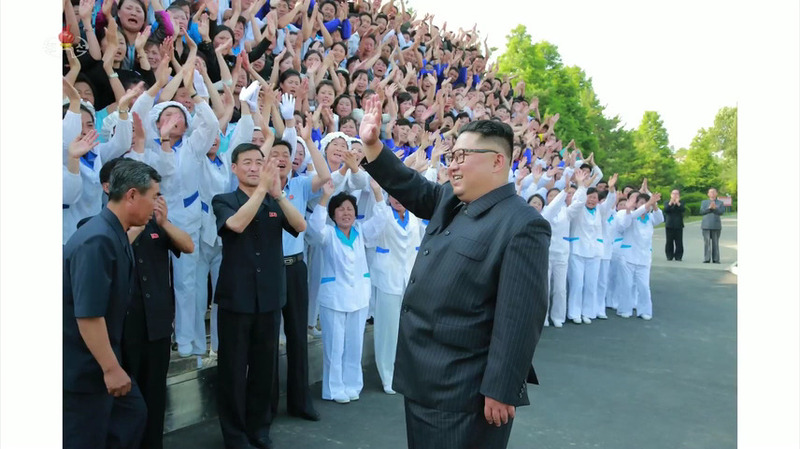 Kim Jong Un responds to the greetings of employees and leading officials of Sinu’iju Cosmetics Factory in North P’yo’ngan Province on June 29, 2018. 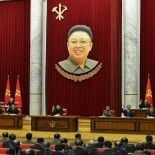 In the background at the right are Jo Yong Won and O Il Jong who did not participate in the photo session (Photo: KCTV). 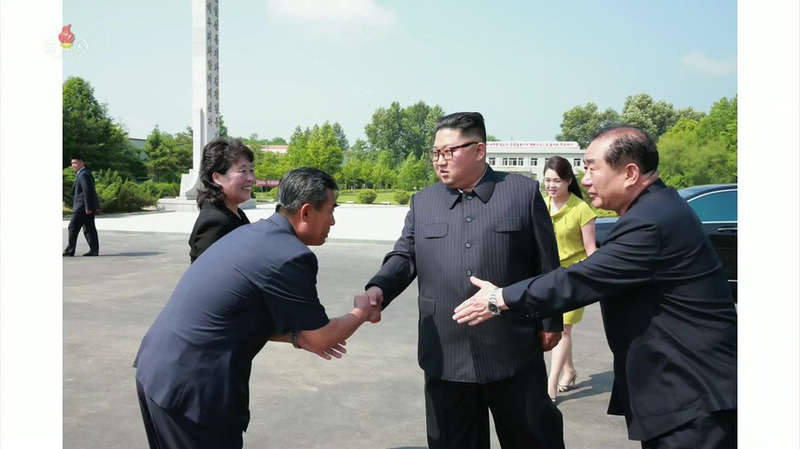 This article was written on 01 Jul 2018, and is filled under An Jong Su (WPK LID), Central Committee, Central Military Committee, Col. Gen. O Il Jong, Comprehensive Affairs, cosmetics, cpc-kwp rels, critical infrastructure, DPRK Cabinet, DPRK-China Joint Guidance Committee, DPRK-China Relations, DPRK-PRC Border, Economic Complexes, Events Management Section, Executive Policy Bureau, Finance and Accounting, Financial Planning Department, Five Year Economic Plan and Development Strategy (2016), General Affairs, Guard Command, Han Kwang Sang, Hwang Pyong So, Hwang Pyong So (GPD; KPA VMAR), Hwang Yong Chol (WPK CC DD), Hwanggumphyong (Hwanggu'mp'yo'ng) Economic Zone, International Affairs Department WPK, International Department, Jo Yong Won, Kim Chang Son, Kim Chong-un inspections, Kim Family, Kim Jong Un Visits, Kim Jong-il, Kim Jong-un, Kim Song Nam (IAD), KJI Personal Secretariat, Korean People's Internal Security Forces, Korean Workers' Party (KWP), kpif, Light Industry Department, Local Party Affairs, local people's committees, Main Office of Adjutants (Central Party Office #6), Ministry of Foodstuffs and Daily Necessities, Ministry of Light Industry, ministry of people's security, Ministry of State Security, North Korean press, North Pyongan KWP Provincial Committee, North Pyongan Provincial People's Committee, Notification, Organization and Guidance Department, party life, Political Bureau, primary party committees, Provincial Party Committees, Provincial Party System, Provinicial People's Committee, Public Information Commission, Ri Sol Ju (Kim Jong Un's wife), Secretariat, Sinuiju City People's Committee, State Affairs Commission, State Planning Commission (SPC), State Security Department, Workers' and Social Organizations, WPK Economic Affairs Dept.